There may be two SoHo channels but hopefully their programming won’t continue to be compromised by lightweight network dramas like SoHo’s A Million Little Things and one of next month’s SoHo2 premieres, New Amsterdam. The latter follows in the mould of House MD and 2017’s The Good Doctor. The Good Doctor was one of the surprise hits of the 2017-18 season, so NBC trots out its own version of the kind of physician everyone wishes they had — one who puts patients first and never asks about co-pays. 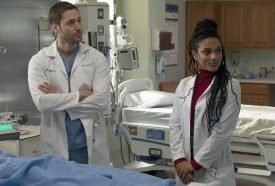 Eggold is appealing, in an old-fashioned, Marcus Welby kind of way, and the show does contain a few unexpected twists … but the idea of a square-jawed doctor who really, really cares feels like an awfully familiar procedure. New Amsterdam will air 8.30 Tuesdays from February 5 but mercifully will be preceded at 7.30 by the much more promising Cleaning Up. 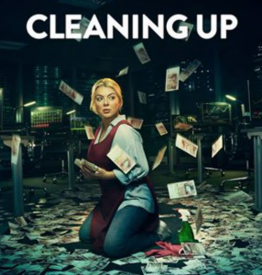 It lands here just a few weeks after scoring rave reviews for Sheridan Smith’s turn as a struggling solo mum who’s a cleaning lady with a gambling addiction. “The role calls for grit, fervour and various shades of armour-plated indomitability, and nobody does it better,” said The Telegraph. Meanwhile, the best new comedy of the last two years, Crashing, is switching from SoHo to SoHo2 for its third season (8.00 Mondays from February 4) as is SMILF for S2 (8.00 Thursdays from February 7). Last Week Tonight With John Oliver also will shift to SoHo2 and win an earlier slot in the transition: 7.30 Mondays from February 18. The Truth About Killer Robots (February 23, 9.30), which is billed as “an eerie, eye-opening work of science non-fiction”. Back for Box Set Saturdays will be: Crashing S2, SMILF S1, Room 104 S2, Just Another Immigrant and The Americans S1-2. I think they’re hurting the SoHo brand by SoHo2 being used for less than premium dramas. They’d be better off strengthening Sky5 I think or calling it something different. Glad to see them giving Last Week Tonight an earlier showing but still bizarre they can’t simulcast it live with HBO a la Game of Thrones.